With Christmas approaching, it's time again for eggnog and gift-giving and space photos of celestial ornaments, hanging thousands of light-years away. The Hubble Space Telescope snapped this image, released by NASA Tuesday (Dec. 17), showing a huge star sending "light echoes" into the dust that surrounds it like a twinkling wreath. The giant star at the center of the image is RS Puppis, which is 200 times larger than our sun and can be seen in the Southern Hemisphere sky. It belongs to a class of very luminous stars called Cepheid variables. These types of stars are unstable because they have used up most of the hydrogen fuel at their core. Cepheid variable stars expand and shrink in a rhythmic pattern, growing brighter and then dimmer over a regular period of days or weeks, as this time-lapse video shows. 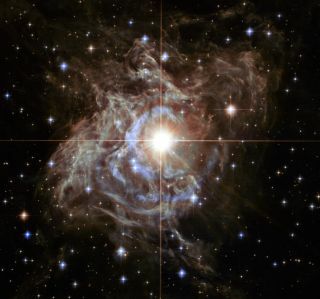 As RS Puppis brightens during its six-week cycle, its sends pulses of light that illuminate its dusty environment. The pulses appear to expand the gas that enshrouds the star, an optical illusion that scientists call a "light echo." Hubble snapped a series of photos of these light echoes rippling through the nebula, according to NASA. "Even though light travels through space fast enough to span the gap between Earth and the moon in a little over a second, the nebula is so large that reflected light can actually be photographed traversing the nebula," a NASA description of the photo reads. Observing these traveling light echoes can actually help astronomers determine the distance of faraway objects; RS Puppis was calculated to be 6,500 light-years from our sun, with a margin of error of 1 percent, NASA officials said. The Hubble Space Telescope, a joint project between NASA and the European Space Agency, launched into orbit in 1990 and transmits about 120 gigabytes of science data every week.